I’m just going to come out and say it. I am absolutely in love with Por’Ketta. At any point when I am even remotely in the vicinity of this truck, I will hunt it down, and promptly order one of everything. 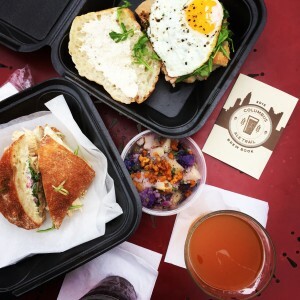 While this relative newcomer to the mobile food scene has a limited menu, every dish is tastier than the last. 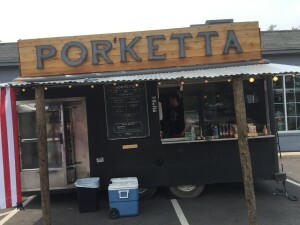 From the name alone, you can automatically guess that the truck’s porchetta is awesome. Porchetta is a scrumptious piece of pork loin, filled with herbs and spices, then rolled and slow-roasted for many hours until it is tender and juicy. Por’Ketta’s version is incredibly flavorful, and is thinly sliced. Those pieces of meat are then piled high on a soft, local Matija Breads roll with arugula and salsa verde. Por’Ketta is actually more of a trailer than a truck, by the way, with built-in rotisserie ovens on the side of the vehicle. How cool is that? If you prefer chicken over pork, the rotisserie chicken sandwich is equally delicious. A dollop of lemon aioli and slivers of pickled red onion pair with the savory pulled chicken, all served on Italian bread. 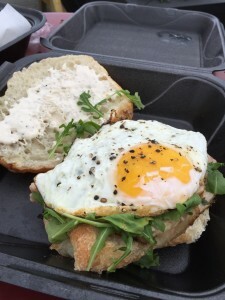 Get any sandwich with an egg on top if it’s available that day, it is messy but worth it. 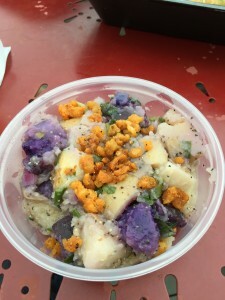 The staple side is the Purple Potato salad: beautiful, tangy, and an ideal complement to those summery sandwiches. Want to feed a crowd? Order the rotisserie meats by the pound too. Many of Por’Ketta’s sides and sandwiches are specials; I hesitate to mention some of them, lest you be disappointed that you can’t get your hands on one of these daily specials. However, two such items cannot be ignored. First, there is the corn salad, served cold and topped with cheese, onions, cilantro, and a smoky dressing. I attempted (poorly) to recreate my own version at home because it was so good. Million dollar reward to whoever can steal the secret recipe of seasonings. Secondly, if they have the Bourbon, Bacon, and Peach marmalade to top your sandwich, do yourself a favor and just order it. Made with Bulleit Bourbon, this sweet and salty concoction should be on everything you’ve ever eaten. 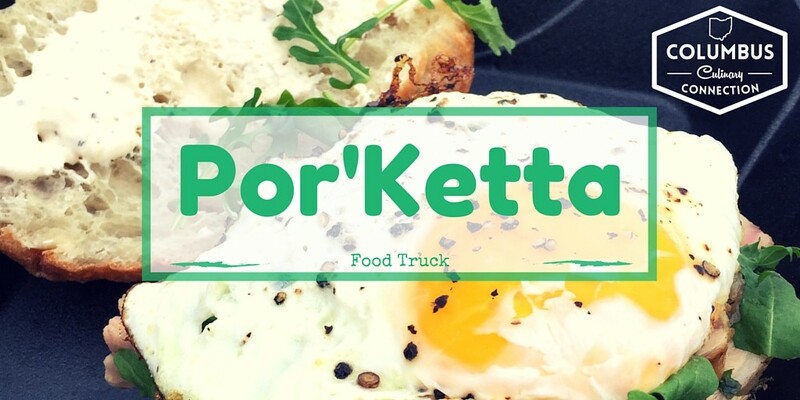 Culinary Clue: One of the other great things about this truck is that Por’Ketta is a family business in every sense. The owners, the husband and wife team of Tony and Michelle Layne, can often be found on the truck along with one or more of their kids. It’s such a great thing to see.